Explaining to a persistent journalist why tame cheetahs are biting people is not easy, so I didn't envy the job of KwaCheetah spokesman Clarke Smith. On Aug. 6, a Tweet said a pupil from Cowan House Preparatory School, Aiden Fry, had been bitten on the shoulder when a cheetah at KwaCheetah launched itself at the fence and grabbed him. A call to the principal, Rob Odell, made it clear he would say nothing about it. Five days later, following further inquiries, a press release from Clarke - who is one of the directors of Nambiti Private Game Reserve near Ladysmith on which KwaCheetah is situated - said a cat had grabbed at the boy's back, scratching and biting him. It added that he was treated and "[was] back at school." It noted that "none of the cheetah at the project has displayed behavior of this nature before," and that "children are not allowed in any of the enclosures." According to Dr Andrew Venter, whose child is at Aiden's school, medical bills for the "bite and scratch," could run to 200,000 Rand (approx. $14,000). But, he said, there was more. The day before this incident, a 73-year-old woman, Glen Dixon, and her grandson were attacked at KwaCheetah. The woman was thrown to the ground and bitten on her arm and head, the cat's teeth puncturing her skull. According to her son, Brett Dixon, her hip broke in the fall and she requires reconstructive surgery to her ear. At the time of writing she was in intensive care. "We are of course extremely worried about her," he said. "This will change her life forever." There was still more; it turns out that on June 28 another visitor to KwaCheetah, Lesley-Ann Marais, was bitten on her arm during an interaction. She had to receive stitches. When I mentioned these attacks to Clarke, he agreed the earlier press release was somewhat limited and issued another one which included the fact that "an elderly lady was knocked down by the same cheetah while inside the viewing enclosure" but it did not explain why her grandson was in the enclosure with her. It also mentioned that previously "a lady visitor had are arm scratched and suffered shallow punctures from a nip by a different cheetah." It noted that "this behavior is totally out of character for the individual cheetah and is being investigated." The project, he said, had now been closed to visitors while the incidents were being investigated. "We were at KwaCheetah with our family in 2012. They had cheetah, caracal, serval and a leopard in various enclosures and the cheetah and leopard were clearly agitated by all the visitors. The handler was particularly worried about the leopard so went in to his enclosure to put what appeared to be a dog harness on him to control him before inviting people in to pet him. My family would not go in because they were worried about the children being attacked, as it kept going for the handler, who hit it with a pillow. The leopard got more and more excited so he asked the few visitors who had gone into the enclosure to leave. The handler was really freaked out by whole situation and told us he was leaving Nambiti the next day. He said he had repeatedly told his bosses that he was very unhappy about the situation, but they kept saying it was fine and that he had to continue taking guests into the enclosure." Trawling Google for cheetah encounters, a YouTube video came to light which begins with a young tourist sprinting ahead of a cheetah and trailing a cardboard box. 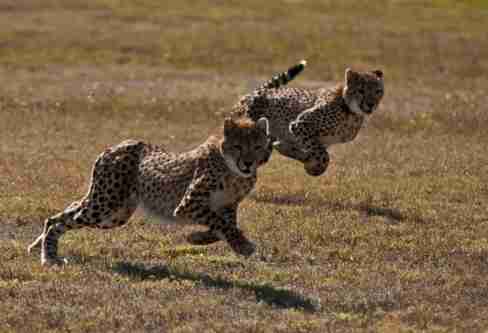 The title of the film, made by American John Watson for Volunteer South Africa, is "Getting Chased by Cheetahs." "It's an experience like no other," he says, "it's a place where volunteers can mingle with cheetahs while helping rehabilitate them into the wild. "I don't like petting zoos," Watson comments to camera, "but this is for the benefit of the animals. It's about truly making a difference." The facility is KwaCheetah. He was clearly not aware that, like most predators, cheetahs are programmed to chase what runs and that the difference between a cardboard box and pink sprinting prey, in the mind of a cheetah, is a small one. According to Clarke's press release, KwaCheetah was established in 2011 to support the conservation of vulnerable cheetah in southern Africa. The website says "the main goal behind the project is not to sell cheetah to zoos or any other likewise place, but to release our cats back into the African wilderness." The release adds that "there are currently at least seven cheetah set to be released into the wild as part of a carefully planned phased release process once the relevant permits, which were applied for some time ago, have been received from Ezemvelo/KZN Wildlife." 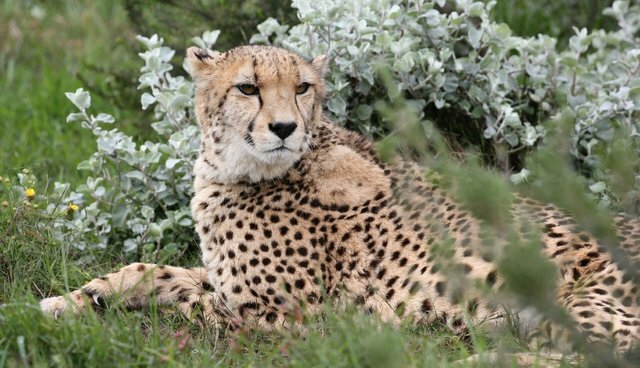 According to a source, for the past four years, KwaCheetah has not had permits to hold or release cheetah into the wild - its stated primary reason for existence. The attacks seem to have forced KZN Wildlife into action and they suspended all commercial operations at the facility. I tried to get clarity on this with KwaCheetah owner Rob Le Seuer, but he said he was recording the phone call, was not prepared to have words put into his mouth and was not prepared to discuss the issue. Complying with regulations, however, is a problem for cheetah encounters. According to KwaZulu-Natal's standards and procedures for keeping wild animals in captivity in a rehabilitation facility, no animals there may be displayed to the public, or have contact with other than facility staff. In addition, no animal may be held in a rehabilitation facility for longer than is required for successful rehabilitation and its return to the wild. It may not be physically restrained "by means of chains, ropes or the like" and no domestic animals are allowed onto the premises of a rehabilitation facility (the KwaCheetah website shows cheetahs playing with dogs and other animals). So is KwaCheetah, as film maker Watson suggests, truly aiding conservation and making a difference? A report by the Environmental Wildlife Trust (EWT) suggests otherwise. Two wild-born female cheetahs now at the facility were hand-reared then "re-wilded" by EWT and a partner at a cost of around 400,000 Rand (approx. $2,800) and were given to Nambiti for release on the reserve. A male cheetah from a different mother was re-wilded at a cost of around 100,000 Rand (approx. $7,000) and also relocated there. "In June 2012 [we] realized that these three cheetahs had been held in captive conditions by the Rob le Sueur Cheetah Project [now KwaCheetah]. Mr Le Sueur had reportedly bought the cheetahs from Nambiti - in which he is a part owner. The cheetah and their offspring are currently being utilized for financial gain in a walk, pet and drive with cheetahs initiative. The reason given was that they were being threatened by lions on the reserve. The current permitting system in KwaZulu-Natal does not allow the movement of wild animals into captivity." EWT carnivore conservation manager Kelly Marnewick said she was not surprised at the attacks. "Wild cheetahs have never been reported to attack humans," she said, "but captive ones can be very dangerous, having lost their fear of humans. They are often bored and associate humans with food." The recent film "Blood Lions" leaves no doubt about the cynical relationship between cub petting, walking with young lions and their eventual demise in "canned" hunts, followed by sale of their bones for Asian "tiger bone wine." Captive-bred cheetahs have a different, less gruesome trajectory, though no less exploitative. Unlike lions, cheetahs are fairly easily tamed in captivity (but never domesticated), making them attractive animals for human interaction. They are currently CITES-listed as "threatened with extinction" in Appendix 1. In South Africa there are fewer than 1,000 cheetahs, several hundred of them captive in 79 facilities. Containment and breeding is usually done under the banner of conservation and education. The public is told that the cheetahs will be released into the wild or that the breeding is bringing the cheetah back from the brink of extinction. "Very few facilities appear to be directly involved with any type of conservation work that directly benefits the free-roaming cheetah population through funding or field projects. The rest appear to have value only in terms of 'edutainment.' 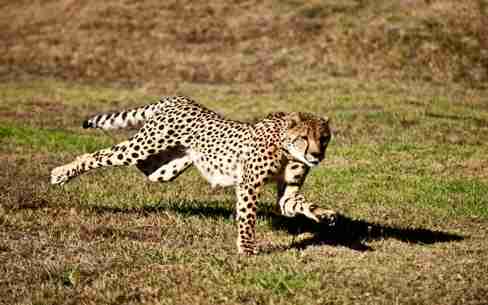 Rehabilitation needs to have cheetahs move through fast and not have tourist or volunteer contact." Beyond the cost of meat and housing them, captive cheetahs make money for their captors. It costs around 300 Rand (approx. $21) for an adult to spend a few minutes with a cheetah and foreign volunteers can pay between $1,000 and $2,000 a week to help "rehabilitate" them by handling them and "teaching" them to hunt. They often continue to pay to feed "their" cheetah after they return home, trusting they are helping to re-wild it. "There's no conservation need for cheetahs to be bred in captivity as they do not address the key threats to cheetahs: persecution, lack of space and sale into captivity. Furthermore, these institutions can have a negative impact on conservation through the sourcing of wild animals to supply captive populations, as well as through the risk of genetic mismanagement (inbreeding,) and providing the wrong conservation message." According to Marnewick, using cheetahs as "tourist bait" is unethical and exploitative and antithetical to conservation: "Most of those outfits should be closed down." Both KZN Wildlife and KwaCheetah now have a complex conundrum to deal with. If the facility doesn't get a permit to release cheetahs, can they justify their claim that they're rehabilitating them? And if they do, can they justify the release of captive-bred cheetahs into the wild despite the findings of a respected conservation organization that this would be detrimental to cheetah conservation?